Has long been a rumor Lian mountain drifting thrills, have long admired. Summer in July, the sea, Meet the the Miluo Pingjiang friends, three car all the way to happily drove to Lianyunshan. Lian mountain drifting area in Pingjiang offer red forest Huan Village, located in the mountains of northeastern Hunan peak Lianyunshan depths. Car, all the way to the winding while on from Pingjiang City, rolling mountains, showing an unruly Shun's character, compete with the Japanese, our hearts along with the speed at Mercedes-Benz. Quickly arrive at their destination, link suddenly the car has been sun roasted lying on the roadside unable to move. Fortunately, there are roadside arbor, it is the locals as the "drift" to set up their stalls to do business under the car, through the arbor shade casually Events friend's car to pick us up. Reach the destination, at first glance, the five-meter flood, embedded in the canyon, a clear river surrounded by layers of Castle Peak, fast-flowing, meandering top-down flow of the distance. Beach, hundreds of red helmets and orange jackets and kayaking, brilliant, such as agate, bright as a gem and integrate into at Castle Peak, floating in green water, the sun reflects the colorful, sparkling. Put the drift has not yet begun, the drift of the dream has brought me to hit the road, the United States in the eyes, drunk in the heart. We can not wait to after finishing put drift formalities, received the helmet, life jacket, paddle, two and one boat into the water, just listen to orders from: "seize" the boat an arrow cosine and shoved it into the river, wiping a long list of cheerful waves, thought is immersed in the flood, cool streams about face as link we embark on the journey to the big baptism. Put bleach officially began, screams, laughter, and echoed the sound of the river naughty boil. Looking around, a red drift put a mighty army, although not million mighty river's spectacular, but everyone lofty aspiration, invincible. 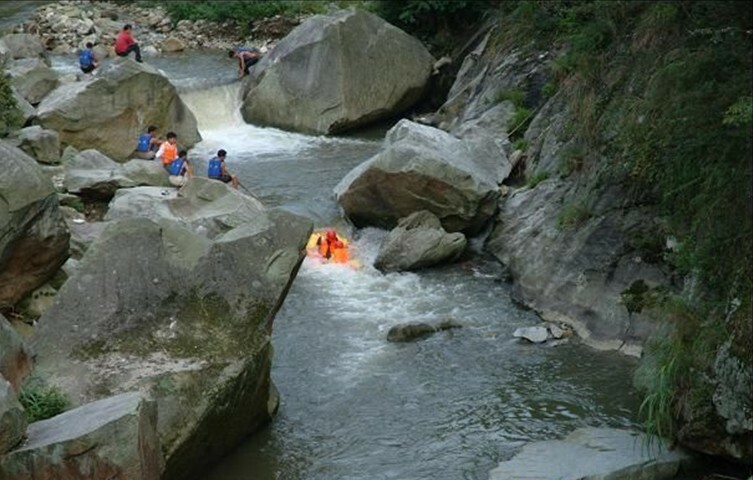 Length of 7 km of the entire river rafting, river bed most 8 meters wide, the narrowest less than two meters, the size of the rapids there are dozens, the maximum gap of nearly five meters. Put bleach, magic cube like rotation, sometimes stormy sea, sometimes calm, rapids from time to time to send us broke into the pit, turning waves like dragons fiercely thrown to the cliff edge, to be twists and turns, only the feeling of people flying, water in the head down, the mountains flew, the way the wind and waves, waterfalls, around, exclaimed one, wow, thrilled. Our boat ran into the deep water vortex is panic, only to feel a lot of relief of hand we dragged out, and before we see the true colors, they hit the road. A sharp turn, ah! Bad in front of several ships yacht torrent rushed upside down, ducking my paddle want to help them, but did not rush to that group of a drowned rat dragged his kayak hit the road. Finally to a large surface, this time the mood is a clarity as if sublimation, Zongmu around, water and mountains, beautiful. I do not know what Wizard ghost helmet skim poured water vocal poured to such orders, everyone wants to pick up the helmet, crazy launched an attack, setting off a water war. For a time, dashing the water column, one after another, everyone is off, such as Xinjiang horse that no image of the old lady, to see who poured too far to see who poured faster. Thus, the challenge sound, screams, Xi Xiaosheng link downtown into one in order to vent the thrill and excitement of surfing. After a fierce water battle with a good helmet, the continuing downward into the goal. Canoeing and under the cross-flow, rolling hills and the surplus eye water changing, it gives the aura, giving wisdom, so that people youthful glow, ruddy. I do not know is the nature of dress of the person or people dress up nature, are reveries, when suddenly floated two bridges, one after the other, small size, the more graceful green bamboo trees of set off, so beautiful , very beautiful! No wonder the Ming Dynasty poet to praise Lianyunshan had a poem: "Jun gift vertical cliffs and strong odd, little knowledge is a the Cang cliff Bi moss seal points spring rain wet Cuise away, Qing Yin the shaded Xiao smoke thick diffuse praise Shudao Lianyun stack, must Lushan wins Wulaofeng. several times Lingtou clouds come and go into Lin Yu from Long. " The staff side of the canyon soon "end-point to!" Pulled back the thoughts that I was traveling. On to get the shore, all of them resembled a drowned rat face get enough surprises and unforgettable. Looking at the Lian Shan the San Lianyunshan water a long time and do not want to close the eye. The way back, as if a voice telling me, do not significantly tired, drifting just as in life, every sprint back, there is a harvest in exchange for the happiness of life and beauty.